18/9/08 — Art Market — Paris, Galerie Turquin — The exhibition which opened yesterday at the Turquin Gallery consists of only three paintings. But it is sure to be at the center of an intense discussion in museum and art history circles. The fact that these are works by David is an event in itself. One of them, Paris and Helen, had been presented at the Musée Jacquemart-André during the small retrospective organized there in 2006. The second, a portrait representing Edmond Dubois de Crancé, a friend of the artist who like him had voted in favour of the king’s death, is totally unpublished but is supported by an impeccable record which can be traced back to the moment David gave it to the model. (turned one-fourth to the right). the copies after the original. Interesting as it may be though, the reappearance of a portrait by David will in no way revolutionize existing knowledge of the painter. On the other hand, the third painting might legitimately claim to do so. This appears to be in fact a preparatory study for one of his greatest masterpieces, and by extension one of the major works in French art, the famous Death of Marat, painted in 1793 to honour a figure considered to be a martyr by the Revolution. The lack of historical documents and any mention in old texts means that specialists can only base their observations on the work itself in order to reach an opinion. The demonstration in the catalogue, written by Hubert Duchemin, is in this light rather convincing, as are the actual viewing and a close exam of the painting. We would like to point out only two elements which, besides its obviously fine quality, might support the claim of authenticity. The first, and no doubt the most determining one, is the manner in which Marat’s head is painted. 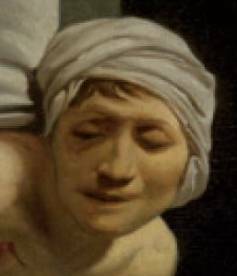 When the canvas is turned, the mouth and the entire face look slightly sunken, much as on a cadaver ; this effect is not visible when the painting is held up straight. None of the other known copies , nor the final painting where the face is more serene and idealized, reveal this detail which seems to exclude the possibility of having been produced by a copier. 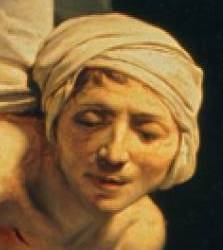 If, however, David executed the work rapidly while standing directly in front of Marat’s body, this post-mortem distortion is easily explained. The second element is the presence of a few repentirs, slight but obvious, notably in the vertical wrinkle of the sheet under the head, which was enlarged, and in the left arm which was originally a bit higher. We will thus let the specialists on David and the Neo-Classics debate on the painting’s attribution which seems to be accepted by many and which underwent a complete study by the company Lumières Technology  published in the catalogue. Given the fact that this is a particularly important work, thus making it harder to be objective, reaching a definitive conclusion will be a difficult task. Nevertheless, we can be sure of at least one thing : its remarkable quality which will be available for general scrutiny during the week it is exhibited. There are four known copies : attributed to Gioacchino Serangeli, Paris, Louvre ; attributed to Jérôme-Martin Langlois, Versailles, Musée national du château ; David’s workshop, Reims, Musée des Beaux-Arts ; David’s workshop, Dijon, Musée des Beaux-Arts. See our articles on multispectral photography (22/9/07, 15/11/07, 22/6/08 and 21/6/08). We regret that the Musée des Beaux-Arts in Brussels did not authorize the same tests on their Death of Marat which would have no doubt revealed some fruitful comparisons.